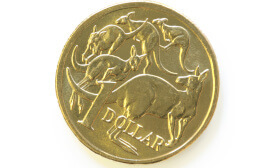 Investors are being warned that the Australian dollar is likely to experience its most volatile month in over a decade. Ellis Taylor, currency specialist at foreign exchange firm World First, said Britain’s referendum on European Union (EU) membership and a possible increase in US interest rates are possible causes of a depreciation of the Australian dollar. “Over the last month we have seen the volatility in the Australian dollar mount as the two crucial decisions build uncertainty in world markets,” he said. The pairing of a US rate rise and a British departure from the EU could see the Australian dollar fall below 70 US cents, he said. According to Mr Taylor, a rate rise in the US is likely to occur “over the next three months”, following improvement in the economy and job market and rising inflation. Mr Taylor did, however, note that full time employment in Australia is reaching record highs and the price of crude oil is recovering, both working to keep the value of the Australian dollar high. The likelihood of a Brexit is difficult to determine, but its potential impact on the financial services industry would be immense.